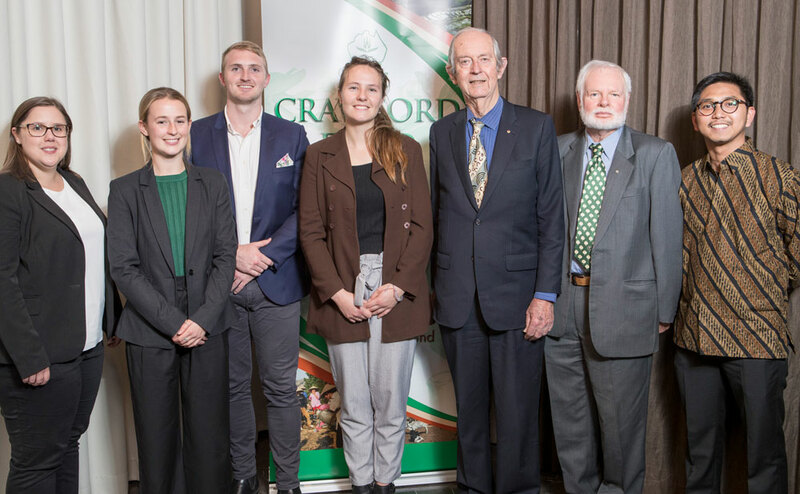 Five scholars from South Australia attended the 2018 Crawford Fund conference – three supported by our SA Committee, and one each supported by Elanco and the South Australian branch of the Australasian Agricultural & Resource Economics Society (AARES). Reading the words, ‘Congratulations Bonnie…’ on the top of a Crawford Fund email was one of the most breathtaking and lightheaded experiences I have ever had. Literally. I became quite emotional after reading the email describing my acceptance to attend the Crawford Fund Conference. I have always been interested in environmental issues, expanding agriculture, ethics of equality and the links that tie those phenomenona together and as soon as I learnt about the themes and focuses of the Crawford Fund Conference, I knew this was the chance of a lifetime. The opening keynote speaker, Dr. Alessandro Demaio, gave an overall ‘wow’ factor in summarising the task of feeding a growing population a healthy and mixed diet whilst reducing detrimental environmental impacts. Did you know that 155 million children are stunted? Neither did I! I wasn’t even aware that this was a significantly dire issue and it wasn’t until Joanna Kane-Potaka’s presentation on ‘Smart Food,’ where she further addressed the issue of malnutrition and explored modern examples, such as rice, where I fully comprehended the issue. Joanna presented the issue of rice, even though being a very popular and staple grain in the developing world, containing significantly less amounts of essential nutrients, i.e. iron, calcium and zinc, compared to millet. Alex Johnson presented a slightly different angle on nutrient deficiencies by focusing on biofortified cereals but I found Alex’s topic complemented Joanna’s and indeed Dr. Alessandro’s, by exploring the low-nutrient content of staple foods, i.e. cereals in Africa and how underlying impacts of malnutrition are wide spread and unaddressed. This was perhaps one of my favourite aspects of the conference, where different academics, all with different experiences and knowledge, presented similar global issues but with differing elements of application, i.e. the location, technology, food source used etc. I found this relatability increased my understanding of issues and perceptions on just how diverse problems can be depending on the global region. The need to sustainably implement these projects addressing malnutrition in areas of most need to them, such as Timor-Leste and Papua New Guinea as highlighted in several presented case studies, is crucial to improve quality of life and lessen the occurrences of health impacts related to malnutrition. The importance of agriculture was admirably discussed throughout the entire three days of presentations. Whether it be, using genetic engineering to biofortify iron in wheat, diversifying staple foods, minimising food waste, improving the nutrient content in farmed fish or even allowing small-holder farmers access into urban markets; the importance of focusing on improving global agriculture and all of its constituents will be the pivotal factor in achieving equality and health for people and the planet. I can’t thank the Crawford Fund enough for allowing me to attend this awe-inspiring event. What I gained from the three days in knowledge, inspiration, ideas and networks does not have any bounds. The opportunities to network were fantastic and allowed me to engage with like-minded people with different ideas and experiences, broadening my own ideas and awareness of the possibilities after I graduate. Attending the Crawford Fund Conference has put the wheels in motion in my head. And these wheels will drive my aspirations and determination to help protect the environment and feed the world sustainably. I currently work as a Postdoctoral scientist in a lab that is working towards the biofortification of wheat and rice with zinc and iron. This year’s Crawford Fund Conference was therefore perfectly themed and I was thrilled and honoured to receive funding from the South Australian Crawford Fund Committee to attend as a Scholar. The main conference started by highlighting the shocking facts about under-nutrition: 800 million under-nourished and 2 billion lacking key micronutrients, but by the end of the day I was encouraged about the inroads that are being made towards providing more nutritious foods. Hearing so many examples of research, from such a wide variety of disciplines, was encouraging and inspiring. A key take-way for me was that I need to be more proactive in creating collaborations and connections with scientists outside of my area. As illustrated by many at the conference, the scale of the problems caused by under- and over-nutrition require multi-disciplinary research teams to solve them. The conference also highlighted the lack of prominence surrounding the issue of over-nutrition and the shocking fact that over- and under-nutrition exist side-by-side in many developing countries. Many posed the question: should we be allowing such wide-scale advertising of un-healthy foods? I remember being shocked by the level of advertising for junk foods I observed on billboards beside highways when I visited the Philippines and it seems from the examples given at the conference that this isn’t the only country where this happens. It was thought-provoking to hear about research from disciplines other than my own and what methods they are using to provide solutions to the problem(s) of under-nutrition. From working with farmers to re-introducing the cultivation of indigenous plants, to high level plant breeding and the creation of a reality TV show aimed to change consumer preference in favour of highly nutritious, but not so popular, sorghum and millets, this conference covered a lot of very interesting ground. Joanna Kane-Potaka’s presentation about the Smart Food initiative was for me a highlight and best encapsulated the overall theme of the conference in its mission statement: “Good for You, Good for the Plant, Good for the Farmer”. As Joanna mentioned, mainstreaming the use of ‘smart foods’ seems to me a great way to get people eating healthier options as their staple food. For me, the other highlights of this conference were the Scholar days that bookended the main Conference. It was wonderful and inspiring, not only to meet so many other young scientists who are also interested in agriculture for international development, but also to meet senior scientists who were so generous in giving their time and energy to help us grow our enthusiasm for working in this area. I have not previously encountered such a warm and welcoming atmosphere at a conference, I wish it was more commonplace. I cannot thank the mentors enough for their participation in these days and for being so willing to introduce themselves to the younger generation of researchers. I think it was Robyn Alders, in her conference synthesis, who said that one of the most important things we can do after attending this conference is to spread the word; not only about the issues of under- and over-nutrition, but equally importantly, about the amazing research being conducted to provide solutions. As pointed out by Andrew Campbell, agriculture, and agricultural research, is the perfect avenue to achieve healthier, more nutritious food, in an environmentally-friendly way, that benefits the wider community and farmers alike. I feel very lucky to have been given the opportunity to attend this year’s Crawford Fund conference and to be able to participate in the scholar activities. The topic, “Reshaping Agriculture for Better Nutrition” is a particularly relevant and intriguing topic that I loved hearing about. I learnt there are so many variables and different approaches to this topic throughout the variety of the key note speakers. The main question people were attempting to answer was; how do we, as scientists and agriculturalists, make food more nutritious and accessible throughout the world? I found the answers to this question extremely interesting. We were formally concerned that we wouldn’t be able to provide enough food for a growing population, but the concern now is whether we will be able to provide enough nutritious food. I have so many examples of people that sparked my interest throughout the conference. Joanna Kane-Potaka mentioned that we need to be giving healthy, nutritious food a good wrap. She explained how nutritious and under-grown millet is. I had never really heard of millet but after hearing her speak, the benefits of this grain seemed incredible. Another speaker that I loved hearing from was the perspective offered by Philmah Seta Waken, who spoke about the importance of nutritional influence in Papua New Guinea. Processed, packaged food has created a lack of knowledge about traditional vegetables and the rich nutritional value they possess. Through their research, Philmah and Tania Paul saw that knowledge about these vegetables was lacking. As a result, cooking classes and school programs were put in place to teach the local community. I loved hearing about this particular story because it illustrated to us that we can find solutions to particular problems and help others. I found it really interesting to get a large, international brand such as Kellogg’s approach on agricultural research. Rebecca Boustead spoke well about the approach of Kelloggs in the Asia Pacific area and back home in Australia. As a large corporation that produces a large amount of processed food, I think she did a really good job at answering sceptical questions. It was also incredible to be able to hear Julie Bishop speak and I was in awe of how passionate she was about agricultural research, particularly in developing countries. The scholar activities were a highlight for me. The atmosphere was extremely welcoming and friendly and the speakers were informative, giving us a lot of inspiration for our future endeavours. It gave us all the opportunity to network which a lot of the time is very daunting for younger people. The opportunity to get paired up with a mentor was fantastic. It was a great way to meet people they knew and feel more comfortable within the space. Overall, the scholar program was an incredible opportunity and I’m extremely grateful I was able to attend. I would say the 2018 Crawford Fund conference and scholar program has been “a positive trigger” in my career as a young researcher in the agricultural development sector. Through this event, I have gained a valuable knowledge, skillset, experience, and most importantly, expanded my networking. The conference theme “Reshaping Agriculture for Better Nutrition” has been delivered well by all the speakers. The conference program was structured comprehensively that started from overview of the nutrition issues both in developed and developing countries to “way forward” to tackle this global issue. What I have learnt from these series of talk is that the nutrition issue is a complex problem, which needs interdisciplinary collaboration among stakeholders in the food chain. Nutrition security can only be achieved, if better practices, for example through technology adoption, are not only implemented at farm level, but also at the whole supply chain. Another thing that most highlighted in the conference is that “food system is the central for achieving multiple sustainable development goals (SDGs)”. It really makes sense if the food system is developed well, it can help in alleviating poverty, ending hunger, ensuring healthy lives, conserving environment and help achieving the other SDGs agendas. There was also a session that showcasing the work international development projects in developing countries on how research and development activities can help feeding people with nutritious food. I learnt that community engagement is an important approach in development activities, to better understand the issues and deliver the benefits of the activities directly to the community. Beside the one-day conference, another interesting program is the Crawford Fund Scholar day activities. Through this program I have met with my mentor Dr Hassan Warriach who is a Postdoctoral Fellow from University of Melbourne. I am so grateful that I have been matched with Dr Warriach as I can directly learn from technical points on the dairy sector development that I can implement to my PhD project. Beside meeting with my mentor, I also met with other 43 scholars with different backgrounds, experiences and research interests. It was really interesting to exchange ideas and learn on what work they are doing and find some overlaps works that can be collaborated in the future. Additionally, this two-day program featured speakers with experiences working in international environment. It was interesting to hear their experience working with local communities, understanding local cultures and customs, and even trying to learn the local language. The take away message from their talks that I think was the most valuable is they started their international career from networks that they have built. There is also a contribution of their mentor in helping them building their career path. Besides networking, enhancing soft skill is also essential, especially communication and team work. Through this piece of my personal reflection, I would like to encourage other young enthusiasts who are interested in international agricultural development to participate in this event. I proudly claim that I have gained a lot of long term benefits from this event that are useful for my future career. This shows me a career path that I can follow and what skillset I need to develop. Lastly, a deep gratitude to AARES SA Branch who have considered my application and sponsored my participation in this event. Thanks to the Crawford Fund and RAID for organising this event and the speakers who have shared their knowledge and experiences. I would like to express my deepest gratitude to Elanco Australia for sponsoring me to attend the 2018 Crawford Fund conference in Canberra, titled “Reshaping Agriculture for Better Nutrition”. The central idea posed by the conference of an “Agriculture, Food, Nutrition and Health Nexus” was of particular interest to me as I work in food safety research, which is closely linked to each of these four disciplines. I was also eager to attend because of the opportunity to connect with other young researchers, share my knowledge and experiences and to engage in international agricultural research and development. The conference opened with the Sir John Crawford Memorial Address, this year delivered by Ms Frances Adamson, Secretary of the Department of Foreign Affairs and Trade. Ms Adamson spoke about the lessons of history and how they have shaped food and water policy both in Australia and abroad. She challenged the scholars and young scientists in the room to take up the fight and innovate our farming systems in the face of climate change and population growth. Her address was followed by a networking dinner, which I found to be a fantastic way to connect with other scholars, Crawford Fund members, industry people, researchers and policy makers in a relaxed and unintimidating environment. My personal highlights from the parliamentary conference were the keynote address from Alessandro Demaio (EAT Foundation) and the address by Dr Jessica Fanzo (UN FAO) which outlined the challenges faced in feeding a growing world population while also highlighting the public health consequences of poor nutrition in both the developed and developing world. I was shocked by the latest world health figures, which show the triple burden of food insecurity, 816 million people suffering from acute hunger, two billion with micronutrient deficiencies and two billion overweight or obese, leaving less than one third of all people on Earth eating a healthy diet. I also enjoyed Professor Andrew Campbell’s (ACIAR) articulation of how the pursuit of food quantity to feed a growing world population has actually come at the expense of nutrition and food quality. He spoke about the challenges that modern agriculture faces in providing sustainable and nutritional food and the need for policy convergence in food, nutrition, water and health to transform our food production systems and deliver better world health outcomes. This core message of embracing diversity in agriculture and agricultural research really resonated with me. As the conference progressed, my appreciation for the diverse range of scientific disciplines associated with agriculture (biotechnology, nutrition, agronomy, and engineering to name a few) grew, and I began to understand the importance of cross-disciplinary action when it comes to tackling large nexus issues. The conference was book-ended by two half days of scholar activities, where 44 scholars, a mix of young students and researchers from around Australia were brought together and paired up with mentors with common research interests and experience in international agricultural development. The scholar activities were coordinated by members of RAID (Researchers in Agriculture for International Development) and were a fantastic experience. I thoroughly enjoyed the informal blend of listening to speakers involved in international research projects and conversing with the other scholars and mentors through the various workshop style networking activities. From these conversations and activities, I was again stuck by the level of diversity in the room, with a unique mix of agricultural scientists, nutritionists, environmental scientists, animal scientists and veterinarians all drawn together under the banner of international agricultural development. Overall, the Crawford Fund Conference experience was one that I thoroughly enjoyed. I intend to take my newfound appreciation for collaboration across agricultural disciplines back home with me to South Australia where I can set my sights on targeting larger nexus issues that converge in the areas of animal health, nutrition, and public health. Thank you to the Crawford Fund for the incredible opportunity to attend and thank you to the organisers of the conference a wonderful, engaging and enriching experience.